This annual conference is for any owner agency—state, local, municipal, county, or their authorized representatives—and any company including its consultants, contractors, or subcontractors, or others who have a designated responsibility in managing an MDOT Let contract. The conference has a full slate of presenters with a wide range of topics: MDOT update, FieldManager® update, finance contracts, Info Tech software, subcontractor compliance, ProjectWise (e-filing system), temporary traffic control acceptance, e-file naming conventions, MDOT Construction Manual updates, MERL, and the status of AASHTOWare Project with a demo. Stay tuned for registration information for the 2020 Contract Management Conference. Registration typically becomes available in late 2019/early 2020. Registration does not include accommodations; the conference flyer contains details on accommodations that are available to participants. Please notify us in advance if you have special dietary needs. NOTE: Michigan Tech reserves the right to use any pictures taken during this event for advertising and/or instructional purposes. CANCELLATION POLICY: No-shows and cancellation within three business days prior to the conference will be charged the full registration fee. Substitutions will be accepted. Questions? E-mail ctt@mtu.edu or call (906)487-2102. 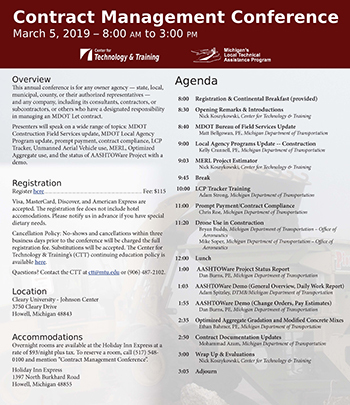 This conference is subject to the Center for Technology & Training's (CTT) continuing education policy. The CTT’s Continuing Education for Professional Engineers in Michigan policy is availaable at ctt.mtu.edu/continuingeducation.